This set of wooden blocks makes for a hopping, barking, purring good time. 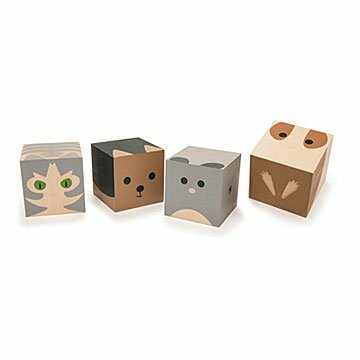 Hop, bark, and purr all playtime long with these whimsical house pet blocks including a dog, cat, mouse, and bunny. Made of sustainable Midwestern basswood and designed with adorable etched faces and feet, your child will be introduced to common critters seen scurrying around the house. Also featured are unique paper backdrops that will boost their imagination as they romp around one-of-a-kind scenes. Made in Michigan. My daughter and stepdaughter both loved these blocks! Both daughters loved these animal blocks.